Sometimes an old book or movie moves me in a way that current literature and motion pictures cannot do. One of these movies is The Mortal Storm. I first saw this movie in the 1950s and it forever changed my psyche as a person just entering my teen years. Given the "mortal storm" we are going through today, I find the message of that movie to be equally moving today. The Mortal Storm is a 1940 film that was one of the most direct anti-Nazi Hollywood films released before the American entry into the Second World War. It was based upon the 1938 book by Phyllis Bottome. 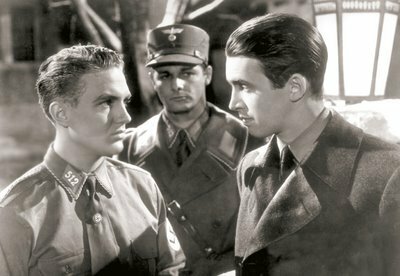 It stars James Stewart as a German who refuses to join the rest of his small Bavarian town in supporting Nazism. He falls in love with "non-Aryan" Freya Roth (Margaret Sullavan). Freya and her family are implied to be Jewish but the word "Jew" is never used and they are only referred to as "non-Aryans." Though it is understood that the film is set in Germany, the name of the country is rarely mentioned except at the very beginning in a short text of introduction. The supporting cast includes Robert Young (Father Knows Best), Robert Stack, Frank Morgan (who played the title role in The Wizard of Oz the year before), Dan Dailey, Ward Bond, Maria Ouspenskaya, William T. Orr, and Bonita Granville. The movie infuriated the Nazi government and it led to all MGM films being banned in Germany, which was a large market for American films at the time. The Mortal Storm begins with the following voice-over: "When man was new upon the earth, he was frightened by the dangers of the elements. He cried out: 'The gods of the lightning are angry, and I must kill my fellow man to appease them.' As man grew older, he created shelters against the wind and the rain, and made harmless the force of the lightning. But within man himself were elements strong as the wind and terrible as the lightning. And he denied the existence of these elements because he dared not face them. The tale we are about to tell is of the mortal storm in which man finds himself today. Again he is crying, 'I must kill my fellow man!' Our story asks, how soon will man find wisdom in his heart, and build a lasting shelter against his ignorant fears?" The powerful ending of the film involves the conversion of the character played by Robert Stack. After his non-Aryan half sister played by Margaret Sullivan is murdered by the Nazis, he runs out of his house and purges himself from any Nazi affiliation giving the viewer the hope that goodness and humanity will prevail. The ending voice-over is particularly poignant. It is from a poem called The Gate of the Year. Although there is a reference to God in the poem, the poem is secular in its message. The poem also has an interesting history. This poem was written in 1908 by Minnie Louise Haskins, an American lecturer at the London School of Economics, who wrote as a hobby. It was a favorite of Queen Elizabeth the late Queen Mother, who showed it to her husband King George VI. He included it in his famous Christmas message broadcast in 1939 at the beginning of the Second World War. After the King's death the Queen Mother had it engraved on bronze plaques on the entrance to the King George VI Memorial Chapel, Windsor, where both are now interred. It was also read at the funeral service of the Queen Mother. At need our human life to know If God hath comprehension? I recently ordered this rare DVD from Videoretro at http://stores.warplowmerchandising.com/StoreFront.bok.